NOTICE: Requires the base game XCOM 2 in order to play. Activation key must be used on a valid Steam account, requires internet connection. This content is part of the XCOM2 Reinforcement Pack and the XCOM2 Digital Deluxe Edition. If you already purchased the XCOM2 Reinforcement Pack or the XCOM2 Digital Deluxe Edition, DO NOT purchase this content here as you will be charged again. 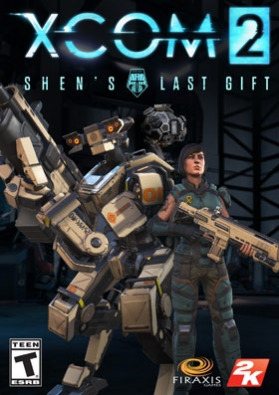 About the game… Chief Engineer Lily Shen accompanies your squad in search of her late father’s secretive final project, discovering a unique new soldier class with powerful combat abilities for your squad. Investigate ADVENT’s “Lost Towers” facility where Chief Engineer Lily Shen accompanies your squad in search of her late father’s secretive final project. Discover a unique new soldier class complete with powerful new combat abilities, strategy mechanics, and customization options. System Requirements	Windows - Minimum Operating System: Windows® 7, 64-bitProcessor: Intel Core 2 Duo E4700 2.6 GHz or AMD Phenom 9950 Quad Core 2.6 GHzMemory: 4GB RAMHard Drive: 45GB available spaceGraphics: 1GB ATI Radeon HD 5770, 1GB NVIDIA GeForce GTX 460 or betterDirectX: DirectX 11Sound Card: DirectX compatible sound card Other Requirements: Initial installation requires one-time Internet connection for Steam authentication; software installations required (included with the game) include Steam Client, Microsoft Visual C++2012 and 2013 Runtime Libraries and Microsoft DirectX. Windows - RecommendedOperating System: Windows® 7, 64-bitProcessor: 3GHz Quad CoreMemory: 8GB RAMHard Drive: 45GB available spaceGraphics: 2GB ATI Radeon HD 7970, 2GB NVIDIA GeForce GTX 770 or betterDirectX: DirectX 11Sound Card: DirectX compatible sound card	© 1994-2016 Take-Two Interactive Software, Inc. Take-Two Interactive Software, Inc., 2K, Firaxis Games, XCOM, XCOM2 et leurs logos respectifs sont des marques commerciales de Take-Two Interactive Software, Inc. Unreal® Engine, Copyright 1998-2015, Epic Games, Inc. Tous droits réservés. Unreal® est une marque déposée d'Epic Games, Inc. Utilise Bink Video. Copyright © 1997 – 2015 par RAD Game Tools, Inc. Ce produit inclut le logiciel Autodesk® Scaleform®, © 2015 Autodesk, Inc. Tous droits réservés. Copyright © 2002-2015 NVIDIA® Corporation pour certaines parties. Tous droits réservés. Animations faciales générées avec FaceFX. © 2002-2015, OC3 Entertainment Inc. et ses concédants. Tous droits réservés. Toutes les autres marques sont la propriété de leurs détenteurs respectifs.